Severe heatwave conditions prevail in this part of the region with mercury touching 42°C today. Conditions are likely to remain the same with temperature expected to touch 45°C in two to three days. Dr GS Bains, head, Meteorological Department, Punjab Agricultural University (PAU), said the dry hot spell would continue for another 10 to 15 days. He urged the farmers to irrigate their produce of vegetables and fruits twice a day so that they don’t rot. The persisting dry spell has aggravated the problems of the residents. The doctors have suggested to avoid going out in the hot weather unless it was unavoidable. They said the heat stroke was the most serious heat-related illness, these days. They stressed that to avoid severe dehydration, good amount of liquid and salt intake was necessary. With unscheduled power cuts being imposed in the city again, the conditions were expected to worsen further. According to a senior official with the electricity board here, power cuts for two to three hours a day were likely to be imposed in the summers. During the peak hours, the otherwise congested roads in the city, present a deserted look these days. Most of the commuters on two-wheelers can be seen properly covered with sunshades and full-sleeves shirts. 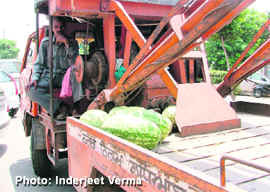 Though the medical experts warn not to consume cut fruits from roadside vendors but to avoid severe heatwave, people can be seen getting respite by having shikanjavi and fruits like melons and watermelons from them. Seeing the extreme weather conditions, even the school managements have reduced their timings by two to three hours. Majority of the schools are expected to close for the summer break from the last week of May. Court of Additional Sessions Judge AK Mehta has sentenced Manu Sidana and his parents Ashok Kumar, Kusum Lata, all residents of Phase-II, Urban Estate, Dugri, to undergo rigorous imprisonment of 10 years each in a dowry death case. Shipra, wife of the prime accused Manu Sidana, had died under mysterious circumstances four years after her marriage. Her body was found hanging from a ceiling fan in her in-laws house. Declining the leniency plea raised by the accused the court held that due to the conduct of the accused, a young life has been lost; as such they did not deserve any leniency. However, the court acquitted prime accused’s sister Vibha Sood and her husband Nitin Sood of the College Road, Ludhiana, finding them to be innocent. Accused were booked under Section 304B/34 of the IPC at the Model Town police station on November 26, 2004, following complaint lodged by the deceased father’s women namely Bal Krishan Bhandari of the Club Road, Civil Lines, Ludhiana. The complainant had submitted to the police that his daughter Shipra was married to accused Manu in February 2000. Later, a son was born out of the wedlock. He had given sufficient dowry at the time of marriage. But her in-laws were not happy. They used to taunt her daughter on the pretexts of bringing less dowry. They raised demand of a Zen car. They were assured that the demand would soon be fulfilled. On November 23, 2004, he received a telephonic call that his daughter had locked herself in the bedroom and she was not opening the door despite repeated requests. Then they went there and found the body of their daughter hanging from the ceiling fan in the bedroom. The in-laws killed her, added the complainant. While the accused pleaded innocence during the trial. They had pleaded that actually Shipra was daughter of crorepati father. She was having number of servants at her parent’s family. But she could not get as many servants after marriage. Due to this she used to remain disturbed and committed suicide. There was no fault of them. But the failed to substantiate their version. The court found them guilty and convicted. In a major development the police has nabbed the thief who had stolen Rs 16 lakh from a shop in Calibre Plaza on May 10. The police has also recovered the stolen amount hidden by the accused in Jalandhar. The accused is identified as Amman Khan, a resident of Lucknow. According to DSP Jaswinder Singh, the CCTV footage had helped the police to identify the accused who had committed the theft at a shop in Calibre Plaza. The DSP said that Amman Khan, who was hired by Neeraj Galhotra, owner of Apsra Cloth house, along with two of his accomplices Umaid, a resident Lucknow and Shabab, a resident of Jalandhar, committed the theft and later fled in an SUV. The DSP said the trio hatched a plan in Jalandhar and made duplicate keys of the shop. According to the plan, Amman stopped going to the shop to evade suspicion. As per the plan, the trio entered the mall on Sunday evening and after committing the theft they returned to Jalandhar. It was during the inspection of the CCTV recordings that the shop owner zeroed in on the accused and informed the police that it was his newly appointed servant Amman, who along with two other accomplices, had committed the crime. DSP Jaswinder Singh said the police was tracking the mobile details of the accused and had sent police parties at various places to nab the co-accused. The police received a tip-off yesterday that Amman was coming to the city to board a train for Lucknow. The police laid a trap and arrested the accused. During the interrogation, Amman cracked soon and told the place where he had hidden the booty. The police raided the house situated near the Jalandhar bus stand and recovered the money as told by Amman. However, his accomplices Umaid and Shabab fled from the spot. Euphoria prevailed in the stock market today because investors believe the new government will put economic reforms, including insurance and banking sectors, on the fast track, industry chambers and stock brokers said. “Today’s unprecedented rise in the stock market is based only on public perception and expectations, that this strong and stable government will be in position to take required decisions to give stimulus to the economy and take corrective measures,” said Satish Bagrodia, president of industrial body PHDCCI. “Investors need to be very cautious in this kind of volatility,” he said cautioning the investors. Another industry body Assocham said the euphoria in the stock market is justified in the wake of stable government coming to power. The new government would be independent in taking reform-friendly decisions as a result pending reforms in insurance, banking and labour would now be taken, the chamber said. The 30-share Bombay Stock Exchange Sensex zoomed 1,305.97 points at 13,479.39, hitting the upper circuit within seconds of opening of trade, following which trading was halted for two hours. After trading resumed, the Sensex soared 806 points at 14,284.21, and this time the trading was halted for the day. It was the first time that upper circuit breaker has been set off in the Bombay Stock Exchange. Circuit breaker is a safety mechanism that has been designed to build confidence of investors in the operations of bourses. A Special Investigation Team would probe into the fake stamp papers racket in the city and would bring the guilty to book. The Deputy Commissioner said this today while directing the SSP to constitute a SIT and immediately register a case against the guilty. The action followed in the wake of a report published in The Tribune that highlighted the scam in the Sub Registrar (Central) office in these columns today. Talking to The Tribune, Deputy Commissioner Gurkirat Kirpal Singh said he had directed SSP Sukhchain Gill to register an FIR immediately and constitute a SIT to investigate the entire racket. He said they wanted to find out how much the state exchequer had suffered and how many people formed the chain of racketeers. Fake stamp papers worth lakhs were passed on to commoners who wanted to pay stamp duty to get their documents registered with the sub-registrar’s office. The scam was unearthed by Sub-Registrar (Central), Maj GS Benipal, who found a stamp paper to be fake. When he observed it minutely, he found that it was a coloured photocopy of an original stamp paper. On that very day he went through all documents registered and found that fake stamp papers worth Rs 1.2 lakh were used while causing loss to state exchequer and hoodwinking the authorities. The investigations by Major Benipal found that on that day only the fake stamp papers were sold to six different parties by stamp vendor, Ravinder Pal Singh, whose license No. is 153. Further investigations revealed that the persons had got their stamp papers prepared from Jyoti of Jyot Documentation in the Dugri area. An advocate presented these to the Sub-Registrar. Major Benipal said a chain of persons who were causing huge losses to the state exchequer was successfully running the entire racket. Banners put up on the direction boards of the municipal corporation on the Ferozepore Road were today removed following report “MC looks other way as Cong flouts rule” published in columns of The Tribune. These banners thanking public for electing Congress Candidate Manish Tewari as MP from the Ludhiana constituency along with the photographs of AICC general secretary Rahul Gandhi and Prime Minister Manmohan Singh dotted the direction boards on Sunday. Taking matter seriously, the tehbazari wing of the corporation today removed all banners which were put up by the Congress supporters on the direction boards following victory of party candidate from the city. The boards are owned by the civic body and no one has right to deface them according to the Municipal Corporation Act. The Congress has won the Ludhiana Lok Sabha seat with thumping majority and the ruling SAD-BJP combine has met with a humiliating defeat. The big margin defeat of the SAD-BJP combine shows the legislators and leaders of both parties in a poor light. The responsibility of the poor performance of the Akali candidate can be put squarely on the leadership of the SAD, which took more than a month to decide its candidate for Ludhiana seat. Sharanjit Singh Dhillon, who was elected to the Lok Sabha from Ludhiana in 2004, had withdrawn from the contest and the party leadership had to search for the candidate. Gurcharan Singh Galib, who was finally selected to be the Akali candidate, had remained in the Congress throughout his political career. He defected to the SAD because he was denied the party ticket in 2004 and this time too he was not sure of getting the Congress ticket. While Manish Tewari, who had been defeated in 2004, had started his campaign before the official announcement about his candidature was made, the Akali Dal leadership had been dithering in deciding the candidature of Galib. As a matter of fact, there was a feeling among the local residents that Maheshinder Singh Grewal, former minister and general secretary of the Akali Dal, was the right choice for the Ludhiana seat. The leadership also knew about it, but kept the decision pending. Grewal, who belonged to the erstwhile Tohra group, was considered very close to Badals as he was a member of the core committee and represented the Akali Dal in all important meetings. It was a tough task for Galib to adjust himself with the ethos of the Akali Dal. Moreover, the Akali leaders did not extend him the desired support. Even the BJP leaders did not put any effort to help him and started working for him only after the May 10 rally of the NDA at Ludhiana, which posted their morale. The BJP leaders were already annoyed with the senior leadership of the Akali Dal as they were promised chairmanship of the Ludhiana Improvement Trust, which had not been given to them so far. The Ludhianvis in general were also not happy with the performance of the SAD-BJP combine in the local affairs like the development of the town. The result of the Ludhiana Lok Sabha seat has also shown the performance of the Akali Dal legislators of the town in a bad light. The Congress candidate won from all urban dominated Vidhan Sabha segments by a big margin. Galib secured marginal lead from Jagraon and Dakha segments only. Tewari had also promised moon to the Ludhianvis as he asserted that he would bring Rs 10,000 crore for the development of Ludhiana town. The Ludhianvis do not have much faith in his promise as in the past too the Congress had not done anything for the development of the town. However, they hope that Tewari would mellow down and give up his arrogant attitude in due course of time. Ludhianvis were sorry that they had not found any sincere leadership for the town. It seems that the two major political parties- the Congress and the SAD are not in the mood of jubilation. The Congress does not have the satisfaction of having decimated the SAD-BJP combine completely as was expected by the people of the state. On the other hand, the SAD seems to be discontented, as the efforts made by the party failed to fructify. Despite of the huge investment of money and political energy in it’s campaigning, the results were not as good as the party had expected. However, SAD chief Sukhbir Singh Badal has the satisfaction that his wife Harsimrat kaur has won from Bathinda. The infighting between the Congress and the SAD remained visible during the entire election campaign. In Punjab Pradesh Congress Committee Amarinder Singh was made in charge of the election campaign of the party. But reportedly he never had the cooperation of the senior leaders like Rajinder Kaur Bhattal and Lal Singh. Rajinder Kaur Bhattal just before the counting of votes said the victory in Punjab could not be attributed to one person. The emotional factor regarding Prime Minister Manmohan Singh, who hails from Amritsar could not be exploited by these leaders. It was at the end of the campaigning that the Congress leaders started using the name of the PM. As far as Bathinda Lok Sabha seat is concerned, Amarinder Singh could not campaign for his son Reninder Singh, because he was in charge of the election campaign of the Congress for the state. In fact, Amarinder’s energy and talent could not be utilised fully. The standoff between Sukhdev Singh Dhindsa and the followers of Surjit Singh Barnala has been going on for more than two decades now and no serious efforts were being made to bring rapprochement among the two. Even at the other Lok Sabha seats, the infighting among the akali leaders is still on. However, the Badals have the satisfaction of winning the Bathinda seat, which has been their bastion for a long time. In a way the family’s hegemony has been accepted in the area. It is also alleged that the Badals had concluded a pact with Dera Sacha Sauda. The BJP leaders did not take the initiative to fight the elections. The central leaders of the BJP had never considered the viewpoint of the Punjab leaders before making any decision. The Badals never took them into confidence for any important decision regarding the development of the state. Only the central leaders were consulted. The state BJP leaders showed little interest in the election campaign till the rally at Ludhiana was held on May 10. It was only after the rally that the BJP cadres were active, as they got the impression that the NDA was coming to power at the Centre. Punjab is going to witness the Vidhan Sabha elections in July; the SAD-BJP combine will have to face an uphill task. The akali leaders have to prove to the people that they stand by their commitments. The SAD chief Sukhbir Singh badal will have to admit that corruption is rampant in Punjab and it does not start from bottom but starts from the top. In the absence of a comprehensive check by the district health authorities to curb the ongoing practise of adulteration in milk, the local populace is being subjected to a large number of health problems, including chronic stomach disorders, ulcers and cancer. The fact that the health department has taken just 25 samples of milk and milk products since January 2009 points toward its lackadaisical attitude. The past record of the department shows that maximum raids are conducted on the dairies and sweet shop owners who sell adulterated milk and milk products during the festival season especially around Diwali. Food inspector Dr Harjot said they regularly take milk samples following the complaints of the people. At the same time the milk vendors and the dairy owners carry on with the malpractices like mixing of ‘germ-infested’ water, urea mixed with water and oil in the milk to increase its volume. Milk being a part of the stipulated diet of the children affects them the most in case of adulteration and also if it is without the proper fat content. And it is a general practice among milk vendors and even the dairy owners to take out natural fat from the milk and substitute it with adulterants. Referring to the recent scandal in China wherein Melamine was found in powdered milk, the doctor said there should be a proper quality check on every company manufacturing powdered milk. Colonel Cheema (retd) said the health authorities should also check the leading cooperative dealing in milk adding, “I had registered complaint regarding bad quality milk to their quality control manager four days prior to the Verka milk scandal wherein officials were reported guilty of stealing milk. The milk of green sachets had a taste of fuel or grease,” he stated. However, the authorities at Verka Milk plant had denied any possibility of adulteration in the milk. In absence of a comprehensive check by the District Health authorities to curb the menace of adulteration in milk, the local populace is facing a glut of number of health problems including chronic stomach disorders, ulcers and cancer. The health department has taken just 25 samples of milk and milk products since January 2009. Despite denial by certain milk plant authorities, it is an established fact that very common are mixing of 'germ infested' water, urea mixed with water and oil in the milk to increase its volume. It is a widely known fact that a number of milk vendors and even the dairy owners take out natural fat from the milk and substitute it with adulterant. Ludhiana Tribune will like the readers to let us know their knowledge on milk adulteration and its effects. Responses, in not more than 200 words, can be emailed to ludhianaconcerns@tribunemail.com or sent to our city office at Bhadaur House, Ludhiana. From the posh drawing rooms with extravagant interiors, the sets of the serials have now shifted to mud houses and fields. From the flashy jewellery and gaudy attires, the focus is now on simple rustic clothes and the leading lady is shown as plain Jane rather than a decked up doll. The focus of the production houses has now shifted to rural backdrops from the urbane. The “saas-bahu” stuff has taken a backseat and social issues form the spotlight of the serials these days. Nitin Vaidya, business head, Zee TV, and chief operating officer, Zee Entertainment Enterprises Ltd, said, "There seems to be a trend, where channels are now shifting focus from saas-bahu sagas as many serials are going the rural way. The Zee TV is the only channel that focussed on a subject close to reality with “Agle Janam Mohe Bitiya Hi Kijo”. We have always believed in subjects that establish a strong connection with the viewers. Most of the shows deal with a pertinent issue." Serials on Zee TV, like "Chhoti Bahu", "Shree", "Agle Janam Mohe Bitiya Hi Kijo" and "Ranbir Rano", all are set against the rural background. While Colors has "Baalika Vadhu" and "Na Aana Iss Desh-Laado" in its kitty, the NDTV Imagine telecasts Bandini, which revolves around a Bengali family. "Ranbir Rano" is a love story set in Punjab's town of Dera Bassi. Serial "Agle Janam Mohe Bitiya Hi Kijo", set in a small town in Bihar, is a story of minority Dalit race called the “Musahar”, who by profession are rat-killers, and which is their only means of survival. To this, the race belongs to a family of six that form the subject of the serial. Roopa Ganguly, playing a prominent role in the serial “Agle Janam”, said she had returned to the small screen after a halt of many years as quality work had come her way. "Giving message on the social issues through serials is a good idea as people even in the villages are close to this medium," she said. "Chhoti Bahu" is set against the backdrop of Brindaban, which also elucidates on the custom, according to which a man can get married to two girls, while "Shree" is a story of a Gujarati family again depicting the years-old custom of people consulting the tantriks and felling into their trap. While "Baalika Vadhu" and "Laado" on Colors, concerning the issues of child marriage and girl birth based in Rajasthan and Haryana, respectively, are also on the list of viewers. TV viewers have also given a nod to these serials. "The dose of saas-bahu tales was getting heavy, which has finally come to an end to some extent. Now, the winds of change have blown and we are able to see quality serials based on good themes and concerning the social issues as well," added Nupur Bhardwaj, a viewer. Nursing institutes here conducted a seminar on "Nursing in modern perspective" to mark the International Nurses Week. A seminar on the theme "Delivering quality, serving communities and nurses leading care innovations" was held at the Mata Saraswati Institute of Nursing Education at Birmi village today. The seminar was presided over by Manpreet Singh Ayali, chairman, Zila Parishad. He advised the students to work with dedication in this materialistic era and keep the profession high among the people. Principal of the institute Swinder Kaur said the nurses should find innovative way to provide quality care with low cost as in pre-term healthy infants "Kangaroo" care can replace the costly incubators care. This system, she said, was developed by an American nurse as an easy, economical, safe, and socially acceptable alternative to the incubator care. Yet another seminar, organised by Dr Mohan Kaur Memorial Nursing Institute here, was presided over by Dr Ravinder Singh, an orthopedic surgeon. The speakers of the institute spoke on the holiness of the occupation of nurses and its importance in the present scenario. A debate session was also held on the subject. The chief guest, addressing the students, laid stress on the importance of the profession of nursing in society. He termed nursing to be the noble profession in this world, where the nurses serve the patients without being biased and wish for the early recovery of them. Principal of the institute M Chakarvarty shed light on the life and contribution of Ms Florence Nightingale in getting the profession established in the heart of the people. She had spread the massage of selfless service by the nurses. She said it was the demand of the day that the practising nurses visited the needy persons and places for effective services. The Sadbhavna College of Nursing, Raikot, today celebrated the International Nurses Week today with fervour. The theme "Delivering Quality, Serving Communities: Nurses Leading Care Innovations" was depicted in the form of a play. A panel discussion was also organised by the students. Students presented choreography on the role being played by nurses in the health sector. Dr DR Vij, president of the Council for Teacher Education, and Dr KK Bajaj presided over the function and gave lecture on the importance of teachers in shaping the students for their future and emphasised on using the innovative methods for classroom teaching and practical experience. Director Dr AK Banerjee congratulated the staff. He exhorted the young nurses to aspire high in life. He advised them to focus on improving the health conditions of the people in community rather than going abroad. The students of the institutes also took the oath of selfless and generous service toward mankind. A brief cultural programme was also presented by the students to entertain the audience and guests. The meritorious students of the institutes were given prizes in academics and extra-curricular activities, participated by them throughout the year. Even for domestic helpers summer-break means a lot. It was interesting to hear the conversation of maids during a birthday party at Sutlej Club recently. One of them was heard saying that she had told her madam that Dalhousie was a better option than Shimla. She said visiting Shimla had become monotonous. Besides being congested, one could not get peace of mind there. While the other domestic helper said she had asked her employers to get a “hut” (cottage) this time as it becomes convenient to work if everything was easily available to you. With their eyes on the sizeable vote bank of migrant population in the mega city, two self-styled leaders of the community had thrown in their hats in the Lok Sabha elections, having high hopes that they will get support of the migrant voters and in the process might make a significant impact on the electoral battle. In the course of their election campaigns, they promised the “world” to the electorate while lambasting both the SAD-BJP combine and the Congress, whom they charged with giving a raw deal to the “poorvanchalis” during their regimes. However, the voters were apparently not impressed by their claims and chose to lend their support to either of the two major contenders, Manish Tewari and Gurcharan Singh Galib. Both the migrant candidates could garner just a few hundred votes each and lost their deposits. A section of physicians, which did not hesitate in issuing fake medical certificates to officials put on poll duty during recent elections, gained due to strictness of the Election Commission about performance of mandatory duty of conducting elections. Besides supporting their claims with medical certificates, the officials seeking exemption were seen wearing cervical collars and other medical equipment. There were others who went to the extent of getting their limbs plastered, suggesting hairline fractures and dislocation. But majority of the assistant returning officers (AROs) kept these officials in suspense till the last day of poll process. They made all these officials attend all rehearsals and training classes and instead of sending them for active duty at polling booths, kept them in reserve staff. Some of such officials were not included in polling parties. The trend created problem for those officials who were in fact suffering from some or the other ailment. The officials, who did not receive any allowance even after marking attendance till the last day of poll process, now repent having spent money on procuring medical certificates. Interestingly, these officials have started attending their routine duty in normal manner and that also without submitting fitness certificates to their parent department. Notwithstanding the ongoing recession there is no dearth to the exhibitions held in the city every few months. Though the industry is crying over the meltdown and many workers have been laid off, the city people are always on a shopping spree. Recently held exhibitions in the city have proved that city is not short of money when it comes to shopping for luxuries. Women were seen shopping for diamonds and all kind of expensive stuff like watches, jewellery and garments. One really wonders that while the corporate houses do not have money to give wages to their workers, their family members are lavishly spending on shopping. When it comes to Ludhiana Municipal Corporation, one would find innovative things being offered as bribe to evade the civic body’s whip. An example of it was witnessed on the Pakhowal road today where LMC employees instead of removing road vendors were taking muskmelons as ‘fees’ for not removing them. The street vendors were seen joining hands and saying namaste to these employees, besides offering them huge muskmelons as a token of salute. It seems that even MC employees take bribe according to season with muskmelons topping the list in the sweltering summer. Though the SAD-BJP leaders and workers are disappointed that their efforts could not make people send the SAD candidate to parliament, they are happy that the rank and file of the Congress did not help its candidate. “Despite so much of hard work we could not make our nominee a winner. It was unexpected that he would lose with such a huge margin. Still we are happy that Congressmen did not work for Tewari, otherwise he could have won by a margin of 2 lakh (votes). It would have become difficult for us to explain to leaders,” said a BJP leader. Close intimacy and reliability on the second wrung leaders in particular and the youth in general held a key to the victory plan of Congress spokesperson Manish Tewari in the 15th Lok Sabha polls. The Tewari campaign had importantly involved the councillors and the party workers at the lowest levels who delivered the results. The involvement of youngsters made a big difference and was strikingly visible on the day of polling. The core team of Tewari, in fact, had a big number of outsiders from Chandigarh and Delhi handling important assignments, particularly paper work, media and other “top assignments”, which was a matter of discussion among the local party leadership. A very careful campaign activity was handled in the rural areas largely perceived as Galib strongholds. Even in reducing the trail margin to couple of thousands in Jagraon and Dakha are seen as victory symbols for Tewari. Jassi Khangura, Kila Raipur MLA, Malkit Dakha and Gurdeep Singh Bhaini also made useful contributions in their respective areas, the rural belt in particular. Against popular expectations, Galib did not manage any significant gains even in the rural segments, including Jagraon, Dakha and Gill. In Jagraon, Tewari trailed behind Galib only by about 4,000 votes and by only approximately 2,350 votes in Dakha. Tewari led Galib by 2,880 votes in the Gill assembly segment. Even in the city Tewari managed a margin of more than 31,000 in Ludhiana (West), which was thought to be a tough area for the Congress. In a small example, Khud Mohalla, largely perceived as an Akali stronghold, saw only 28 votes in favour of Galib against 450-odd votes in favour of Tewari. One important issue being highlighted by campaigners was that the top leadership of the country from the NDA alliance did not utter a single word seeking vote for their candidate Galib during the ‘maha rally’ before the polls. Local candidate Galib and SAD candidate from the adjoining constituency Fatehgarh Sahib Charanjit Singh Atwal stood as mute spectators when the cream of the country’s opposition leadership took to the stage. On the other hand, Prime Minister Manmohan Singh made a special mention asking for votes for Tewari in the last address to the nation at a press conference before the polls. Rahul Gandhi also made a special appeal to the voters of the city for Tewari’s candidature when he addressed a rally earlier. The Dairy Farmers' Association of Punjab today came out in support of Verka General Manager, Balwinder Singh, against whom a case of milk pilferage has recently been registered. The farmers have even threatened that if case against the general manager wasn’t withdrawn in the next seve days, the association will resort to an indefinite agitation. Daljit Singh Sadarpura, president, Progressive Dairy Farmers' Association, alleged that Balwinder Singh was being falsely implicated by the higher officials for "vested interests". He claimed that the general manager was an honest man and it was a planned conspiracy to defame both Verka and its general manager. "We have decided to meet Chief Minister Parkash Singh Badal soon and request him to intervene into the matter. Today eight out of 12 Board of Directors have extended their support to the general manager, which clearly conveys the message that he is not corrupt. Once the tanker is loaded from the plant, it becomes duty of transporters to see that milk is safe. The general manager hardly comes into the picture. A few transporters were blacklisted by the general manager because of their misdeeds. A revenge has been taken by all those persons in connivance with our higher authorities but we will never tolerate this high-handedness", alleged Sadarpura. The Dairy Technocrats Association and the Milk Plant Workers Union has also extended support to the general manager. Sakinder Singh, the member of worker union, said the entire episode had brought bad name to Verka as well. "The plant provides us our daily bread, why should anybody defame it for his own interest? We will struggle against this high-handedness", said Sakinder Singh. The general manager was booked under Sections 379, 272 and 407 of the IPC, allegedly for stealing milk from the tanker and then supplying to a private dairy owner in the city. Reeling under severe staff shortage, the Ludhiana Municipal Corporation has appointed a private Swiss-company Ms Gaherzi as independent quality assurance consultants to ensure quality in the Jawaharlal Nehru National Urban Renewal Mission (JNNURM) flats coming up at Giaspura. The appointment has come on the directions of the government. According to information, the company has its headquarters in Mumbai and they are presently looking after many projects of the Central government in Punjab. The sources in the Municipal Corporation revealed that the team has been formed after the directions of the Punjab government to ensure quality in government-aided projects. Notably, these flats for the economically weaker section under the JNNURM are proving to be a white elephant for the Municipal Corporation as escalated costs of the dwellings are borne by the civic body, which is already running short of funds. The project is coming under basic services to urban poor, a sub-mission of JNNURM, where 20 per cent of the construction cost would be paid by the civic body. The cost of each dwelling has increased from Rs 1,28,550 to Rs 2,31,000 and the increment, which is above Rs 1 lakh per flat, would be paid by the Municipal Corporation. The construction of these flats is presently being taken up by Ludhiana Builders, Chaddha Builders, Deepak Builders and Inder Mohan Builders. Naveen Chaddha of the Chaddha Builders said, “The work is going on at a good pace and we have time till March 31, 2010 for completion of the task. We are trying our best to complete the construction on time, provided Municipal Corporation is regular with its payments.” He revealed that around Rs 50 to 60 lakh were spent monthly on construction. Timely and coordinated action by residents of local town and cops saved a thickly populated habitation from devastation even as a fire at a power transformer, laid in busy market, left at least two shops partially burnt yesterday night. The incident took place at around 11.30 pm when residents were sleeping in their houses. “I was about to go to sleep when I heard thundering sounds. I was shocked when I saw 20-foot high flames from a power transformer installed in the market and fire spreading fast to the nearby shops and houses,” said Manmohan Singh, adding that all his efforts to call officials of the Punjab State Electricity Board (PSEB) proved futile. It was only after the arrival of a cops led by the city SHO that organised action to douse the fire began. Rescue operations continued for at least four hours. However, timely action by the cops and the residents saved the fire from spreading to the adjacent shops and the offices. Shops belonging to Salim, a vegetable wholesaler and Pandit Amba Datt, an astrologist, were partially burnt in the incident. Actual loss due to burning of jute bags, stored in the vegetable shop and computers and furniture lying in the astrologer’s office, were yet to be ascertained. The residents said the fire could have caused havoc in the locality as the transformer that caught fire was situated in the middle of the market. “The losses could have been much more if the cops and the residents wouldn’t helped in dousing the fire. Had two fire brigades not reached on time, we would have failed to save the adjoining houses,” said Sanjay Sood, a social activist. He urged the administration to compensate the victim. An annual executive body meeting of the Akhil Bhartiya Grahak Panchayat, Punjab unit, was held at Chandigarh today. Office-bearers and executive members from various districts of the state attended the meeting to discuss the activities and achievements in their respective areas. During the elections held for the next tenure, advocate Yatinder Sharma from Chandigarh was elected state president, Ashok Kumar Garg from Bathidna as state general secretary, GD Bansal from Ludhiana and Sunil Dutt from Chandigarh were elected senior vice-president and vice-president, respectively. Parduman Singh Thukral from Jalandhar was elected secretary. Rajinder Bansal from Bathinda was elected office secretary and Gian Chand Garg from Mansa was elected treasurer. Dr SB Pandhi from Ludhiana, Brij Mohan from Kapurthala and Rajan Singla from Bathinda were elected state press secretaries. HS Sachdeva from Ludhiana, Ravinderpal Singh from Kapurthala and Hanuman Dass Goyal from Abohar were elected executive members of the state-level body. The bhog of Bibi Bhagwant Kaur, chief patron, Guru Nanak National College, Doraha, was organised at Dr Ishwar Singh Memorial Hall today. Prominent leaders and personalities of the area, office-bearers, members and staff of Guru Nanak Model Senior Secondary School and Guru Nanak National College attended the bhog. The family donated Rs 2 lakh in memory of Bibi Bhagwant Kaur. The amount would be spent on giving scholarships to the needy students. Maheshinder Singh Grewal, former Cabinet Minister, Punjab, paid tributes to the departed soul and appreciated the enthusiasm with which Bibi Bhagwant Kaur carried on with the benevolent task initiated by her husband Dr Ishwar Singh, a renowned physician, educationist, social worker and an active politician of the area. He also lauded the selfless services offered by her to the educational institutes of Doraha and the surrounding areas. “She carried on with the task of imparting education and awareness among the masses despite ill-health,” said Balwant Singh Pangali, general secretary, College Management Committee. He also remembered the monetary and emotional solace provided by her to the destitute and widows of the area for whom she had opened a destitute centre in one of the villages. “The poor and the deprived looked upon here as their god mother, who had come to their rescue at the time of dire need,” said Jaswant Singh Gill, director of the college. The Municipal Corporation would soon be getting technical assistance by Leicester City of the United Kingdom under the MoU signed between the Mayors of both the cities. According to the document signed between councillor Manjula Sood, Lord Mayor of Leicester and Hakam Singh Giaspura, Mayor, Ludhiana, the agreement would help to bring opportunities for collaboration between both the cities. Also, it would help to promote and encourage trade and investment delegations, study tours and tourism between the two cities. The MoU also stated the desire of exchanging technical expertise. The document was signed on May 8, but it was kept under cover following the code of conduct. Sources in the Municipal Corporation revealed that Mayor Hakam Singh Giaspura was not ready to sign the agreement fearing the code, but since the delegation had come from the UK and all preparations were made, the ceremony was kept a low-key affair. Sources said a piece of paper stating a general aspiration of both the parties was signed between the Mayors, but the formal agreement would be signed after the code of conduct got over. Sources said the signing of the MoU was done with efforts of the Punjab Link Council chief executive Baljit Singh. The delegation comprised five members, including Mayor Manjula Sood, councillor Pyara Singh Kaler and D Helen. D Helen gave a presentation on how successful the collaborations were of the cities as far as cultural links and close working relationships were concerned. The local unit of the Rotary Club will organise an obesity awareness programme and a free check-up camp at Sidhu Hospital on May 24. Surender Seth will be the chief guest. Dr Gurdip Singh Sidhu, president, local unit of the Rotary Club, said it was unfortunate that most of the people did not realise that the obesity, was a chronic medical problem and required medical treatment. The diseases, which are associated with obesity, like diabetes, hypertension, heart diseases, dyslipidaemia, infertility and certain cancers are even more dangerous, are silent killers. “Once the obesity is effectively treated, these diseases also disappear spontaneously,” he said. The club has requisitioned services from a variety of medical and allied healthcare professionals of Sidhu Hospital, who will address various modalities of weight loss and maintenance of the same. All the medically approved options for weight loss will be discussed. Dharamjit Singh Jaggi, local unit’s secretary of the Rotary Club, said the patients belonging to financially weaker sections will be offered special concessional package by the hospital on recommendations of the club. The Shiromani Khalsa Panchayat has hailed the Congress-led UPA victory in the Lok Sabha elections saying the truth and honesty has triumphed. A meeting of the body, also attended by leader of the Panth Akali Dal Tarna Nihang Mewa Singh Khalsa, held here today observed that the Punjabis, particularly the Sikh panth, deserved to be congratulated for voting in favour of Congress candidates to reinstall Manmohan Singh as the Prime Minister of the country. Nimana said the meeting had lauded the farsighted people of Punjab who had refused to be influenced by sponsored but false propaganda of development by the Badal government in print and electronic media, and had given a clear mandate in favour of the Congress. The meeting further noted that majority of the people of Punjab had rejected the traditional Akali Dal leadership and the voters had taught a befitting lesson to the Badals for giving up “panthic agenda” and entering into an unholy alliance with the BJP and the RSS. Students of Saraswati Model Senior Secondary School here have shown commendable results in Class VIII examinations conducted by the Punjab School Education Board. Principal DS Gosain claimed that theirs was the only school in the block to secure two merit positions. Sujata Yadav, who secured 90.25 per cent marks, and Pooja Kumari, who secured 89.75 per cent marks, have been placed in the merit list. Also a total of 10 students have got above 80 per cent marks and 19 students have secured above 60 per cent marks. The total result of the school has been 98.3 per cent. With an aim to provide healthcare services to the villagers falling under Primary Health Centre (PHC), Hathur, Dr SP Sharma, civil surgeon, Ludhiana, flagged off a mobile van here today. The van was loaded with the facilities like X-ray and laboratory, which will also have a team of health officials, including two medical officers, one lab technician, one radiographer, one staff nurse and a helper. Six persons were booked for allegedly beating up a villager here today. In a complaint lodged with the police, Gurtej Singh, a resident of Chankoiyan Kala village, had accused a few residents of his village of beating him up for supporting their opponent. The accused have been identified as Chiri, Jagga, Nikka, Bunty, Amrik Singh and Avtar Singh, all residents of the same village. A case under Sections 341, 323, 427, 148 and 149 of the IPC has been registered against the accused. No arrests have been made so far. Meanwhile, four persons were booked for beating up Jatinder Kumar, a resident of New Model Town, Amloh Road, here today. In his complaint, the victim alleged that Joginder, Narinder and Ravinder, all brothers, and another person named Praveen Kumar, had beaten him up. A case has been registered against the accused. After struggling for nearly a month from a fatal bullet injury, hairstylist Jeewan Mattu succumbed to his wounds at DMC Hospital, here today. Mattu was shot in the neck as he tried to intervene in the two warring groups at H-Block, Sarabha Nagar market, on April 23. He was the owner of ‘Hollywood hairdresser’ in Sarabha Nagar. The incident took place on April 23 around 10.15 pm when a group of heavily armed men, led by Manvir Singh of Gill village, entered the shop and opened fire at Jasvir Singh of Shahjad village. Mattu was trying to protect his customer, when the assailants shot a bullet in the neck of the victim, while the other two bullets missed the target. He was rushed to DMC Hospital where after prolonged struggle he succumbed to his injuries. The police has converted the case into a murder case. Meanwhile, DSP Bhupinder Singh said the hunt for the accused was on and they would be nabbed soon. The students of BVM Senior Secondary School, Udham Singh Nagar branch, gave an excellent performance to stamp their superiority by clinching 23 medals in the 5th Ludhiana District Kickboxing Championship held at Saraswati Modern School, Civil Lines, here recently. Players from this school bagged 12 gold, five silver and 6 bronze medals to prove their class. The medal winning students are: Gold -- Megha Gaur and Vaibhav Gaur in the U-9 years section; Navrattan Singh in the below 37-kg group, Sawan in the below 47-kg group; Prabhat Singh in below 42-kg group; Vipul Gupta in below 63-kg group; Shubham in plus 69-kg group; Govin Maini in below 51-kg group; Shashi Kant in below 63-kg group; Lokesh in below 69-kg group; Gaurav Shouri in below 54-kg group; and Gagandeep Walia in below 91-kg group. Silver medal winners include Rohit Rawat in below 47-kg group; Parul in below 69-kg group; Nitin Oberoi in below 51-kg group; Hemani Sharma in below 57-kg group; and Ramandeep Singh in the aero-kickboxing section. Bronze medal winners are Karan Verma in below 47-kg group; Saurabh in below 47-kg group; Adiyta in below 51-kg group; Saurabh Chadhaury in below 51-kg group; Parvesh in below 63-kg group and Mohit in aero-kickboxing section. Principal of BVM School, Udham Singh Nagar branch, Sunil Arora congratulated the students and in charge, sports, Baljeet Gill for bringing fame to the school.